It was sooo windy yesterday while trying to take these pictures. Literally like 25 mph wind. Thank God I had my hair up. But if it means cooler temps I will take it! I bought this faux fur vest from forever 21 and a while ago and just never wore it until Yesterday. I can't find it online but I linked a couple of very similar ones. I love wearing vests in the Fall and Winter. It is just a esy way to spice up any outfit. Also, Nordstrom is having their clearance sale now through November 11th. You can save up to 40%! They have so many great brands included in this sale, Like Tory Burch and Kate Spade. I listed a few things that I have my eye on below.I am really loving the the red Tory Burch Bag. Happy shopping! really, who can resist a nordstrom sale? and that emerald top is such a pretty color! perfect for this time of year and the time of year to come. thanks for sharing! I love this look, Jade! 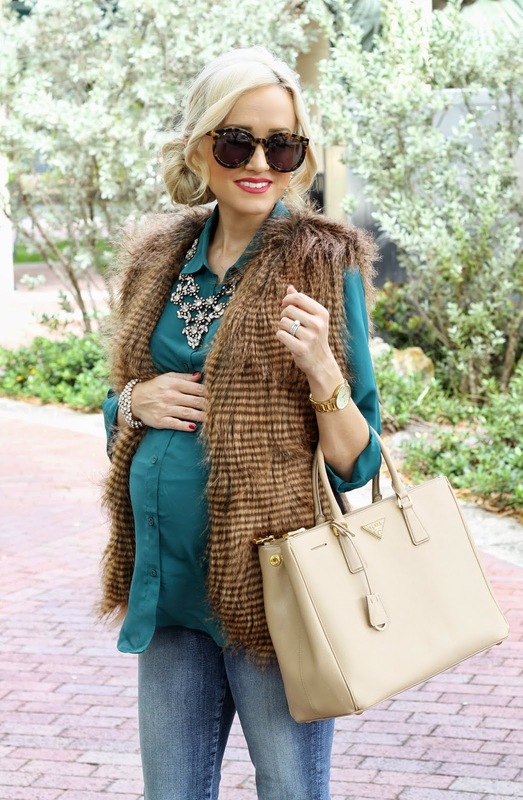 That top and faux fur vest pair so perfectly together!! So pretty! This look is beautiful, love it so much! That fake fur vest is perfect! Love this color combo! I never would have thought to add the fur vest but it's the perfect statement piece! Loving this look and die for faux fur vests, I am wearing one today! Love the emerald color and the fur vest looks great! Doesn't look like it would be from FV21, I have been trying to find some myself! Gorgeous outfit, you look so glamorous!! Love your style, it's so inspiring and perfect! Love that emerald green color on you! It's stunning! You look amazing! I love the color of your blouse! That vest is fabulous! I would have never guessed it was from Forever 21. It looks way more expensive and I love the color of the blouse you paired it with. Adorable casual chic look! that statement necklace is fabulous! I am loving fur everything right now. 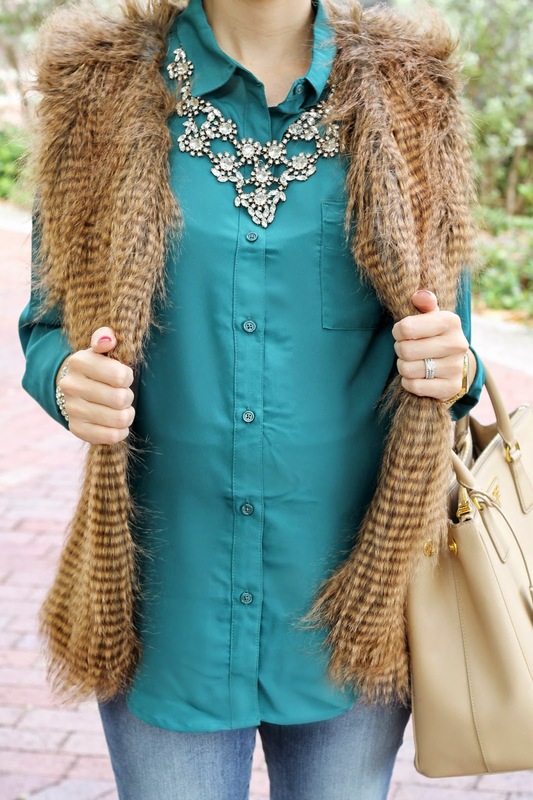 I love every single part of this outfit; fur vests are my go-to this Fall, that emerald color of your blouse is such a gorgeous color, & that statement necklace is unforgettable!